The United Nations Postal Administration issued this 80¢ stamp Feb. 4 to celebrate the 60th anniversary of the United Nations. The design depicts the U.N. General Assembly. stamp for use from the UNPA post office in Vienna, Austria. All of the stamps picture U.N. buildings. The U.N. General Assembly in New York City is featured on the commemoratives for the 60th anniversary of the United Nations. Czeslaw Slania, the world-famous stamp engraver, hand engraved these designs for the United Nations. 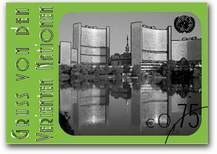 The 0.75-euro hologram definitive depicts the Vienna International Center, one of the four headquarters buildings of the United Nations. The other headquarters are located in New York City; Geneva, Switzerland; and Nairobi, Kenya. Stamps are issued for use from the New York, Geneva and Vienna offices but not for the Nairobi office. The U.N. 60th Anniversary stamps bear denominations of 80¢ for UNPA/New York; 1.30 francs for UNPA/Geneva; and 0.55e for UNPA/Vienna. The stamps measure 50.34 millimeters horizontally by 35.50mm vertically. They are perforated gauge 12. The vertical sheets of 20 stamps bear four marginal inscriptions of the special logo for the 60th anniversary, two in the left margin and two in the right. Also, one copyright symbol appears in the lower-left margin. The souvenir sheets, which are denominated $1, 3fr and 2.10e, respectively, measure 100mm horizontally by 80mm vertically. The stamps on each souvenir sheet are imperforate (have no perforations) and measure 50.34mm horizontally by 35.50mm vertically. Banknote Corporation of America printed the stamps and souvenir sheets by a combination of the intaglio and offset processes in the following quantities: 395,000 80¢; 270,000 1.30fr; 310,000 0.55e; 135,000 $1 souvenir sheets; 125,000 3fr souvenir sheets; and 165,000 2.10e souvenir sheets. Slania was born near Katowice, Poland, in 1921. Even as a young boy, he demonstrated advanced talents for drawing and producing miniature engravings. When he was older, he enrolled at the Academy of Fine Arts in Krakow, recognized as one of the best art graphic centers in Europe. While still a student, Slania was employed by the Polish Stamp Printing Works, where he learned to engrave in steel, a harder, more demanding metal than copper. The first stamp engraved by Slania was issued by Poland March 24, 1951 (Scott 499). After engraving 23 stamps for Poland, the young engraver went out into the world to seek his fortune. He came to Sweden in 1956 and began engraving stamps for the Swedish post office in 1959. Since then, he has engraved more than 1,000 stamps for numerous postal administrations, including those of the United States and the United Nations. In 1986, he produced engravings for six U.N. stamps on the theme "Philately - The International Hobby" (Scott UNPA/New York 473-74, UNPA/Geneva 146-47, UNPA/Vienna 62-63). Two of these stamps reproduce engravings that show Slania at work, hunched over a polished steel die. 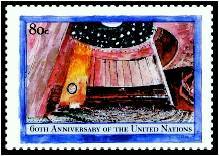 In 1997, six U.N. stamps incorporating the 1986 designs were issued to pay tribute to the stamp hobby (Scott UNPA/ New York 714-15, UNPA/Geneva 312-13, UNPA/ Vienna 228-29). His 1,000th stamp was issued March 17, 2000, for the Swedish Post (Scott 2374). There are Slania clubs in several countries, and there is also a great interest in nonpostal engravings by Slania. For example, he has engraved portraits of kings, queens, political figures, heavyweight boxing champions and film stars. As of October 2004, Slania has engraved 1,070 stamps, most of them (approximately 400) for Sweden. In August 2000, the Guinness Book of Records awarded him three world records. Because of the number of items he has engraved and the beauty, speed and proliferation of his engravings, Slania is the worlds most famous engraver. The United Nations was established Oct. 24, 1945, by 51 countries committed to preserving peace through international cooperation and collective security. Throughout its 60-year history, the United Nations has played an integral part in shaping global events through its humanitarian and peacekeeping activities. In 1945, representatives of 50 countries met in San Francisco at the United Nations Conference on International Organization to draw up the charter of the United Nations. Those delegates deliberated on the basis of proposals worked out by the representatives of China, the Soviet Union, the United Kingdom and the United States. The United Nations Postal Administration issued its second hologram definitive stamp Feb. 4. This 0.75-euro denomination is for use from the UNPA office in Vienna,Austria. The charter was signed June 26, 1945, by the representatives of the 50 countries. Poland, which was not represented at the conference, signed it later and became one of the original 51 member states. The United Nations officially came into existence Oct. 24, 1945, when the charter had been ratified by China, France, the Soviet Union, the United Kingdom, the United States and a majority of other signatories. United Nations Day is celebrated Oct. 24 each year. To date, 191 countries are members of the United Nations. When states become members, they agree to accept the obligations of the charter, an international treaty that sets out basic principles of international relations. According to the charter, the United Nations has four purposes: to maintain international peace and security; to develop friendly relations among nations; to cooperate in solving international problems and in promoting respect for human rights; and to be a center for harmonizing the actions of nations. The United Nations is not a world government, and it does not make laws. It does, however, provide the means to help resolve international conflicts and formulate policies on matters affecting all people. At the United Nations, all member states - large and small, rich and poor, with differing political views and social systems - have a voice and a vote in this process. The United Nations has six main organs. Five of them, the General Assembly, the Security Council, the Economic and Social Council, the Trusteeship Council, and the Secretariat, are based at U.N. headquarters in New York. The sixth, the International Court of Justice, is located at The Hague in the Netherlands. The General Assembly, which is pictured on the stamps, is a parliament of nations, where all U.N. member states are represented. Each member state has one vote. Decisions on such key issues as international peace and security, admitting new members and the U.N. budget are decided by two-thirds majority. Other matters are decided by simple majority. In recent years, a special effort has been made to reach decisions through consensus rather than by taking a formal vote. The assembly cannot force action by any state, but its recommendations are an important indication of world opinion and represent the moral authority of the community of nations. The General Assembly usually conducts its annual regular session from September to December. At the start of each regular session, the assembly elects a new president, 21 vice presidents and the chairmen of the assemblys six main committees: the Disarmament and International Security Committee; the Economic and Financial Committee; the Social, Humanitarian and Cultural Committee; the Special Political and Decolonization Committee; the Administrative and Budgetary Committee; and the Legal Committee. To ensure equitable geographical representation, the presidency of the assembly rotates each year among five groups of states: African, Asian, Eastern European, Latin American and Caribbean, and Western European and other states. In addition to its regular sessions, the assembly can meet in special sessions at the request of the Security Council, of a majority of member states or of one member if the majority of members concur. The 0.75e Vienna hologram definitive is the second hologram issued by the UNPA. The first, released March 28, 2003, is a 70¢ stamp showing U.N. headquarters in New York City (Scott UNPA/New York 839). In 2006, the UNPA plans to issue a definitive hologram for use from the UNPA/Geneva office. The UNPA/Vienna hologram measures 35mm horizontally by 50mm vertically and is perforated gauge 13. The horizontal sheets of 20 stamps have two marginal inscriptions, two in the top margin and two in the bottom. The marginal inscription consists of the U.N. emblem with the German text "Vereinte Nationen" above the emblem and the year 2005 below it. There is one copyright symbol in the lower left. Cartor, a French security printer, printed the stamp by offset in a quantity of 360,000. For more information on the U.N. 60th Anniversary stamps and the UNPA/Vienna hologram, contact the United Nations Postal Administration, Box 5900, Grand Central Station, New York, NY 10163-9992; telephone 800-234-8672; fax 212-963-9854 or e-mail unpa@un.org.